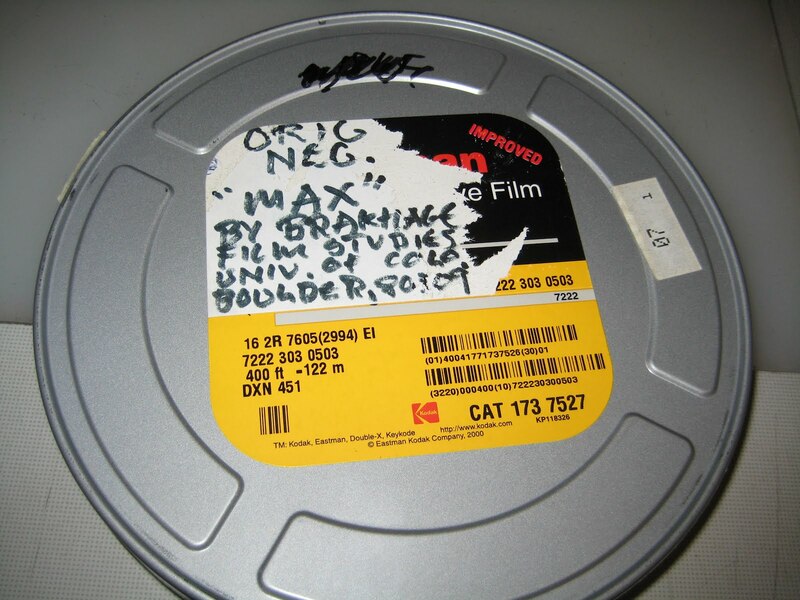 Here’s a picture of the can that contained the original negative for Stan Brakhage’s late film Max (2002), a loving portrait of the family cat. It’s a lovely film, but it’s fair to say that it’s not necessarily a particularly well-known or widely acclaimed work from Stan. But what does make it particularly significant is that it is one of only two films that Stan ever shot and finished on negative, and the ONLY film he ever shot and finished on color negative. For anyone reading who may not be familiar with film stocks and their history, it was far more common for 16mm independent/experimental filmmakers to shoot and finish in reversal film than in negative film until about the 1980s. Reversal film essentially refers to film that, when shot and processed, yields a positive (rather than negative) image. The earliest 16mm film stocks (beginning in 1923) were reversal, as they were primarily designed for amateur use – the filmmaker would shoot a movie, process the film, and then be able to project the original directly. Kodak’s first widely marketed color film, Kodachrome, was also reversal, as was its later counterpart, Ektachrome. In fact, if my research serves me right, Kodak didn’t even offer a color negative camera stock for general sale in 16mm until 1963-64 (though 16mm black and white negative existed for quite some time before this). Even after this, so-called experimental filmmakers didn’t very commonly use 16mm color negative, likely for a few reasons. It was, at the time, more expensive. There were also, at the time, many more film stock options in reversal than in negative. There were even three different Kodak reversal print stocks co-existing throughout the 1970s. It was also harder to edit for filmmakers who did their own cutting – one would really have to edit a workprint (which many did, but many didn’t) and then match the negative to the workprint, and for some, I imagine the abstraction of the negative image was not as intuitive to work with. Finally, it could also be that negative stocks’ tendencies to be more easily scratched and dirtied, and the increased and potentially distracting visibility of negative dirt and damage (appearing as white rather than black in a projection print) may have dissuaded some from working with it. None of this is to say that Stan only shot 16mm negative on these two occasions. As far back as the 1960s, he began to periodically shoot or print onto color negative, to be used in either of two different ways. In some cases, the negative would be incorporated into a positive original as-is, i.e. as an orange-base, color negative image treated as positive, as with films like Scenes From Under Childhood (1967) and the Sincerity films (1973-80). Sometimes the negative would be printed, and the resulting print would be cut into the originals, sometimes alongside its negative counterpart (as in The Process (1972), Tortured Dust (1984), and Agnus Dei Kinder Synapse (1991)). The originals for quite a few films from this period incorporate color print this way (usually 7384 and 7386 print stocks). Some films are entirely or nearly entirely color print originals, such as The Thatch of Night (1990), Visions in Meditation #1 (1989), Boulder Blues and Pearls And… (1993), and Delicacies of Molten Horror Synapse (1991). Other films incorporate a diverse mix of color print, Kodachrome, Ektachrome, and other stocks, such as Visions in Meditation #2 (1989), The Mammals of Victoria (1994), and The Cat of the Worm’s Green Realm (1997). One interesting by-product of this filmmaking approach is the increased presence of both positive and negative dirt/damage in the films that incorporate color print stock. As Stan used what was most likely just dry-gate dailies in his editing of color print, there is usually some noticeable negative dirt printed into the color positive stock. Additionally, while Ektachrome and especially Kodachrome were fairly resilient to scratching during his editing process, the color print stock was softer and more susceptible to damage, so (usually) green and yellow emulsion marks and scratches are often visible in these films. If you have volume 2 of Criterion’s ‘by Brakhage’ DVD series, you can spot these qualities in some of the aforementioned films. 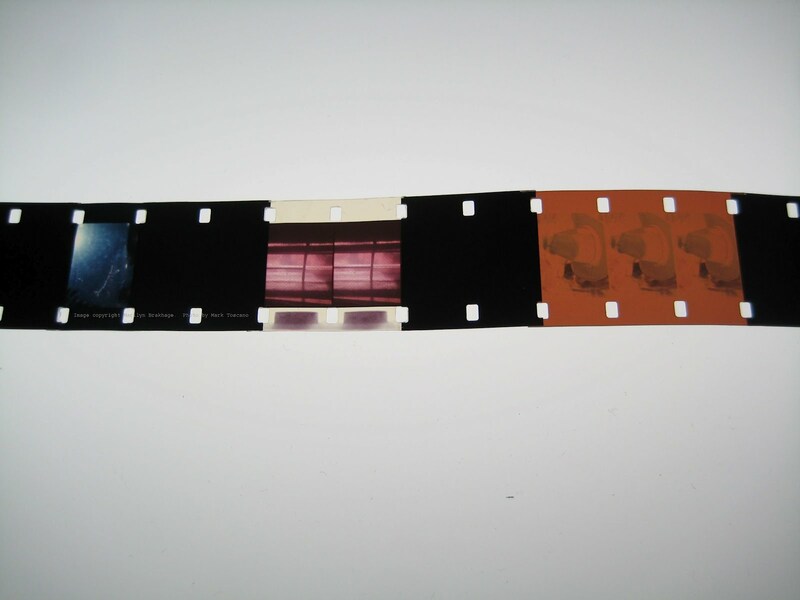 Original picture roll for Tortured Dust (part 2) (1984), showing (L-to-R) one frame of Kodachrome, two frames of faded color print, three frames of color negative. Also on display here is Stan’s signature technique of splicing in 2 frames of black leader at every single cut of a film. Previous Previous post: Goodbye, Bob. Next Next post: A million projects.